If your life is filled with anxiety, low self-esteem, anger or depression, this program offers a new and exciting approach to feeling at peace with yourself and the world. You will also find this program an important part of your peak performance library. Better control your emotional states is a key element for success and well-being. With less stress you will instinctively make better decisions, feel healthier, and have more confidence every day. Reduce the stress in your life, make better decisions, and feel better all day � with Changing Emotions. I am no stranger to Dr. Glauberman's HPP tapes. They are top shelf. 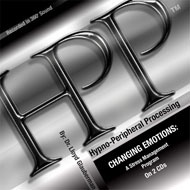 I've never found any NLP or plain hypnosis tapes that are even comparable. However, media mail was really slow and the CD cover was cracked. CDs look to be in good shape though. I know from experience these work and I will be ordering more in the future. Best on the market is my opinion.